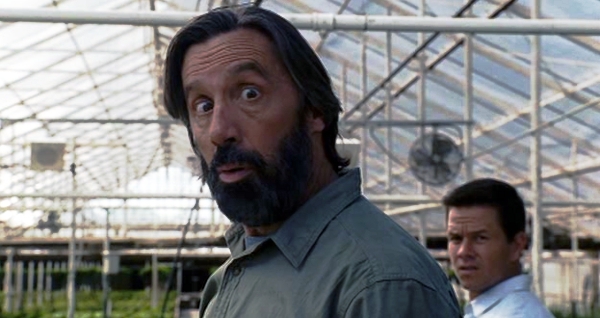 Movie Beards: Nursery Owner: "The Happening"
"Plant wind, plant wind all around, but nobody wants to hear. Plant wind, plant wind all around, it's the terrorists they fear. Of a nursery owner with a full-on Nature Beard." Welcome to Opposite Land, where M. Night Shyamalan reigns supreme at the height of his career. Everybody hated The Sixth Sense and thought the story could have benefited from some sort of big twist. Maybe Forrest Gump Jr. should have been schizo? Regardless, M. Night continues to redefine the word "masterpiece" upon the release of each of his films, which sequentially make more sense and get less aggravating. M. Night Shyamalan truly is the best story-teller in Opposite Land. In The Happening, M. Night directs a bunch of silly nitwits as they experience something that happens, yet they can't figure out what is happening or why it is happening. They begin to figure out where it is happening and who it is happening to, but the what and the why remain inside an infinite loop of conjecture. Only a modern genius such as M. Night can hide such a profound environmental message inside an enigmatic web of empty family issues, unnatural dialogue, and unintentionally hilarious acts of violent suicide. So which beard should interject in order to drop some knowledge? Montage Beards take time, of which Marky Mark and the Funky Bunch have little. A Scientist Beard would be helpful, but nobody bothered to grow one. My friends, the only beard to help you in this, our darkest hour, is the Nature Beard belonging to a Nursery Owner, a man whose beard is as serious as his stare. While everyone is quick to blame terrorists, for which they have zero evidence, the Nursery Owner is the first to exhibit any intelligence and place blame on the plants. The Nursery Owner's Nature Beard allows him to have direct communication with the plant wind. Each individual hair in the beard senses a change of wind velocity, humidity, and atmospheric pressure to send a signal from the follicle to the brain through a series of synapses. He knows the plants' secrets, and he knows their fears. He also loves hot dogs because they have a cool shape and lots of protein. If you don't like hot dogs, you might as well be dead to him. Unfortunately, the Nursery Owner succumbs to the ways of the plant wind. Like any man of nature, he knows he will now become one with the earth. Nature welcomes the Nursery Owner into her open arms. His bearded corpse will decompose and supply her with the building blocks of life. His flesh will feed the flies, and his organs will feed the soil. In time, the Nursery Owner's beard will become the beard of the earth -- the grass that blows in the wind, forever whispering an unheard message into Marky Mark's ear. **All credit for the term "plant wind" goes to Joe White.